Villa Kinara offers a rare fusion of six bedrooms, striking architecture, stunning entertainment space, swimming pool deck and a sensational location on Bali’s south-west coast, moments from the beach and Seminyak’s boutiques, bars and restaurants. All bedrooms are huge, with seating areas and terraces according myriad private corners. Even more spacious is the open-plan living room defined by soaring teakwood columns and furnished with over-sized sofas, home entertainment centre, bar, billiard table, and 12-seater dining table. Set within an exclusive residential enclave behind the Oberoi Hotel, five minutes from Ku Dé Ta, Villa Kinara is perfect for groups of friends, or a few families who want space to spread out in their own peaceful, private, fully-staffed, three-pavilion villa a short stroll from Seminyak. Delice appear as one that could steal your heart away and settle your opinion for an affordable and exclusive private villa for rent located in the most prestigious Seminyak area. The architecture and design of this villa emphasize its simple appearance with soft and comfortable color without too much decoration. Convertible dining living and kitchen area giving spacious atmosphere as the freedom is fully in your hand to choose your own level of conformity. TheJavanese style door can be fully close for you pampered by the cool breeze coming from the air conditioner and the roaring ceiling fan or even fully open it and let the natural breeze embrace the room. Bali Baik Villa is a distinct addition to the city’s skyline. The city center is merely 0.5 km away and the airport can be reached within 20 minutes. Also within easy reach are Living Room, Sate Bali Jl Laksmana, Paul’s Place. 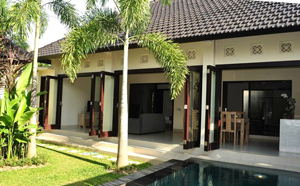 The facilities and services provided by Bali Baik Villa ensure a pleasant stay for guests. While lodging at this wonderful property, guests can enjoy safety deposit boxes, car park, laundry service/dry cleaning, Wi-Fi in public areas, tours. Guests can choose from 6 rooms, all of which exude an atmosphere of total peace and harmony. The hotel offers an excellent variety of recreational facilities, including spa, garden, outdoor pool, massage. Bali Baik Villa is your one-stop destination for quality hotel accommodations in Bali. 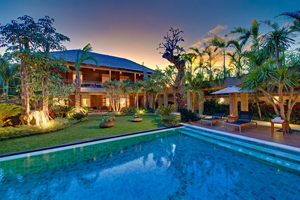 Villa De La Vie Seminyak is a refined and sophisticated tropical lifestyle villa in bali that awaits you, it is amongst the islands most impressive 5-star hotels, such as The Oberoi and The Legian. This 4 bedroom villa in Seminyak is one of the few villas in bali that is walking distance to internationally acclaimed beachfront restaurants, including the famous Ku De Ta and La Lucciola. Seminyak presents an exciting nightlife, together with a plethora of trendy boutiques, and luxurious spas. This villa features a spacious open plan living area for lounging and dining. It overlooks 16 x 5m swimming pool, a cozy Jacuzzi and an open bale that sits over the water. Surrounded by well-groomed lawns and beautifully landscaped tropical gardens this Bali villa property will surely impress.